FAIRFIELD -- The Ridgefield girls basketball team missed out on the FCIAC tournament this season, so it had nearly two weeks to think about and prepare for Fairfield Ludlowe in the first round of the Class LL state tournament. Finally given the chance to get back to live action after 12 days of practices and scrimmages, the uncaged Tigers roared to a 53-33 victory over Ludlowe in the state tournament opener Monday night. No. 18-seeded Ridgefield led 15-0 after the first quarter and never took its foot off the gas pedal. 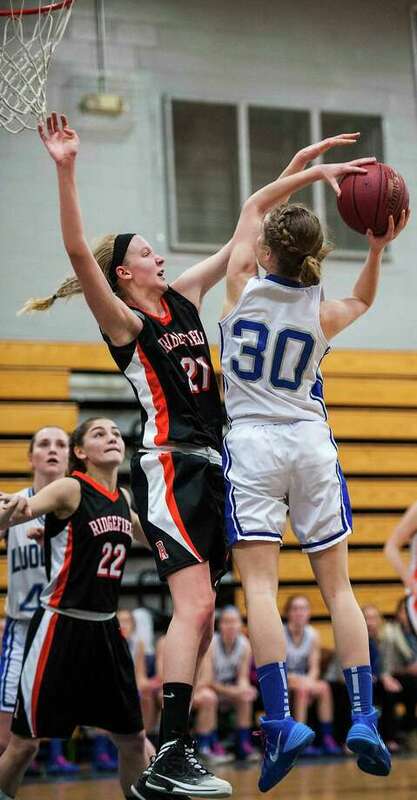 "We didn't want our season to end today," Ridgefield senior guard Andrea Ferrero said. "We definitely came together and played as a team unlike I've ever seen us play before. We've been developing over the whole season, and finally we're realizing that, when we play as a team, we can beat anyone." Ferrero led Ridgefield with 14 points -- including eight in that pivotal first quarter -- and Rebecca Lawrence and Carly Mercede scored 12 apiece. Caroline Pangallo paced No. 15-seeded Ludlowe with 12 points and Pauline Blatt scored eight. The prolonged layoff following the conclusion of the regular season seemed to reinvigorate the Tigers. "We played two good scrimmages and we've just been coming to practice every day with the attitude that we have to be intense if we want to keep going on," Ferrero said. "None of us wants the season to end." Coincidentally, Ludlowe was the team which knocked Ridgefield out of the state tournament last year. The Falcons had gone on the road to score a first-round win in Ridgefield last year. Ludlowe won the regular-season meeting between the two teams. Despite the trailing 26-10 at halftime, Ludlowe refused to go quietly. Five points from Pangallo and two by Blatt in the opening minutes of the third quarter trimmed Ludlowe's deficit to a very manageable nine points with a lot of basketball yet to be played. The home crowd was alive, and the momentum, which had been on Ridgefield's side all game, was beginning to swing. However, that was as close as the Falcons came. Sandra Carpenter's layup off a pass from Ferrero with 3:10 remaining in the third quarter put Ridgefield's lead back to double-digits, this time to stay, 28-17. Ferrero followed with a 3-point dagger from the corner, and just like that, the Tigers were back in control. Ridgefield advances to play at second-seeded Lauralton Hall on Thursday at 7 p.m. The Crusaders had a first-round bye, and several of their players and coaches were in the Ludlowe gym Monday checking out their upcoming opponent. For Ludlowe, it was a tough way to end a very promising, very successful season. After chalking up 15 wins in the regular season, the Falcons were defeated in the first round of the FCIAC and state tournaments. "There's only one team that's going to end with a win, and unfortunately, that is obviously not us," Ludlowe coach Sarah Huntington said. "My seniors -- Sara Grabowski, Julia Von Ehr and Pauline Blatt -- have been so integral in the transformation of our program. They were talking about how, our first season, they were 5-15, and just over the course of the four years they've gone from girls who play basketball to ball-players who happen to be girls." Andrea Ferrero 4 2-2 14; Meaghan O'Hara 0 0-0 0; Andrea Bedard 1 1-2 3; Kathryn Middlebrook 0 0-0 0; Madison Wiley 2 1-2 5; Rebecca Lawrence 5 2-2 12; Carly Mercede 5 0-0 12; Jessica Camarda 2 0-0 5; Sandra Carpenter 1 0-0 2; Paige Andrews 0 0-0 0. Totals: 20 6-8 53. Pauline Blatt 4 0-0 8; Sara Grabowski 0 0-0 0; Caroline Pangallo 5 0-0 12; Charlotte Blatt 2 0-0 4; Regan Steed 1 0-2 3; Julia Von Ehr 0 0-0 0; Meghan Curran 1 0-0 3; Trish Auray 1 1-2 3; Caroline Yates 0 0-0 0; Julia Pangallo 0 0-0 0; Alex McKinnon 0 0-0 0; Sullie Desmond 0 0-0 0; Peyton Brown 0 0-0 0. Totals: 14 1-4 33. 3-pointers: R-Ferrero 4, Mercede 2, Camarda. L-C. Pangallo 2, Steed, Von Ehr.